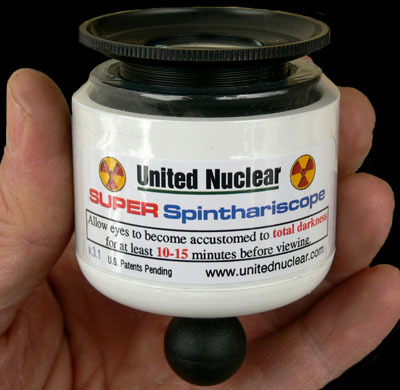 The Super Spinthariscope is an improved version of our classic Nuclear Spinthariscope. 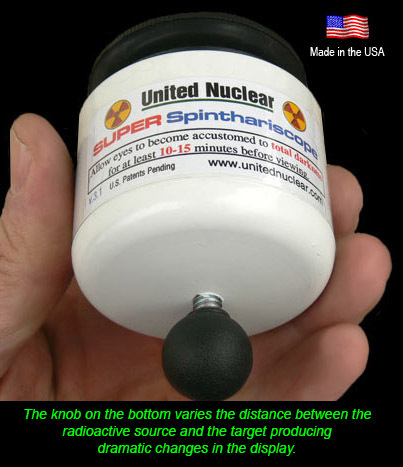 The Super Spinthariscope allows the user to vary the distance between the radioactive source and the target by means of a small knob on the bottom of the unit. Rotating the knob to the left pulls the source away from the target producing a wide dispersal of Alpha particles impacting the full area of the target. The result is a reduced level of scintillations throughout the entire target area. Turning the knob to the right moves the source closer to the target producing a tight beam of Alpha particles. This produces a visible fury of activity impacting a small area of the target center. 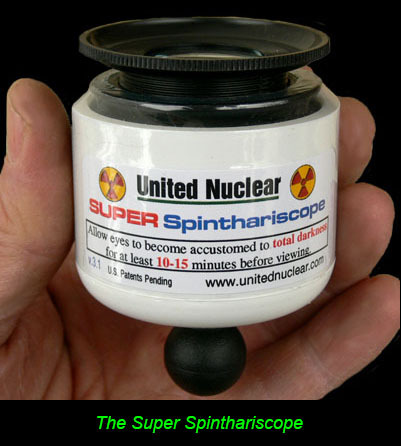 Just like our Nuclear Spinthariscope above, the Super Spinthariscope does not contain any dangerous radioactive material. Instead, it contains a tiny speck of extremely high grade Thorium ore, specially mined & imported for us from the Great Bear Lake in Canada. This Canadian radioactive ore is very unique in its chemical composition, and is the only natural occurring radioactive material that will put on the dazzling nuclear display you see in the Spinthariscope. The small speck of radioactive material is permanently sealed within the device and does not pose any health or radiation risk. This small radioactive source is sealed in a metal tab and permanently bonded within the unit. The target material is a special "activated" blend of ZnS that we manufacture ourselves... all sealed under clear plastic. As the source material undergoes natural radioactive decay, atoms of it continuously explode, releasing Alpha Particles traveling at over 20,000 miles per hour. Although Alpha particles can only travel a little over an inch in the air.... and can't even penetrate a sheet of paper, they can however hit the ZnS target suspended directly above the source. When these Alpha Particles hit the ZnS, it releases a photons, the basic component of light. This produces the thousands of tiny flashes (scintillations) of blue-white light you see through the magnifying lens. The Super Spinthariscope features an adjustable focus, requires no batteries or any other form of energy, and will continue to operate producing tiny visible nuclear explosions for at least 60 years. Each Spinthariscope is individually handmade and assembled by our craftsman. the handheld Super Spinthariscope is quite sturdy. it is completely safe for both children & adults to use.